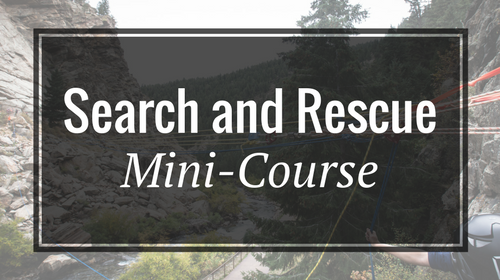 Search and Rescue (SAR) professionals wear many hats, and this mini-course was specifically designed with those search and rescue professionals in mind. Search and Rescue (SAR) professionals wear many hats during their careers. Logistics and protocol gobble up much of your training time while ground pounding and search grids often consume the lion's share of SAR professional. However, the “technical rope rescue” side of things is always the elephant in the room; less than 10% of any given team can truly wrap their head around all that goes into this stuff. The Seach and Rescue Mini-Course was specifically designed with the search and rescue professional in mind. You may be asking yourself, "What about litter handling?" Don't worry... We've included material on that as well! Spanning huge gaps without the need for highlines. This course is brought to you through the efforts of multiple Rigging Lab Academy Instructors. These instructors have hand-selected material from their full-featured courses — all of which are exclusively available here at Rigging Lab Academy — and contributed them to a specific section or unit of this course. By blending the teachings of various instructors, Rigging Lab Academy members will gain exposure to different areas of expertise, course materials, and teaching methodologies. Anyone who is affiliated with a search and rescue or a technical rescue team should review this mini course. Just the right amount of information to jog away the cobwebs for those who do not use this equipment all the time. Very worthwhile to take!! This course is good for the basics and a good refresher for technicians. Informative, up to date text with easy to use web pages, too. Good stuff. Very interesting course! It inspired me to carry out more training with the Rigging Lab Academy !! This mini-course has great didactic content! It's a shame that it is not available in Spanish so we can share it with our co-workers here in Peru. Dynamic, simple, and concrete! I hope you create more courses in Spanish, or learn English quickly. Congratulations on this project -- it's excellent! Thanks! For us so far away and unable to participate, this comes as a precious gift. Keep up the good work! Greetings from Serbia! This was a great review of the many aspects and techniques that in compass rope rescue. Definitely worth the time. Thank you. This mini-course covered a very wide range of topics. They did not always flow from one to the next. In particular, the sections on anchoring could have been grouped together to serve as the basis for the subsequent sections.